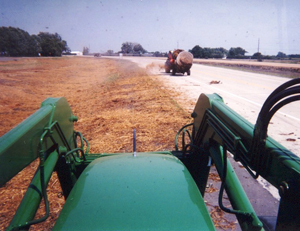 Straw mulch is spread on top of grass seed along a state highway to protect the seed from run off in case of high winds or rain. Mulch also keeps moisture in the ground, promoting stronger & faster germination & growth. 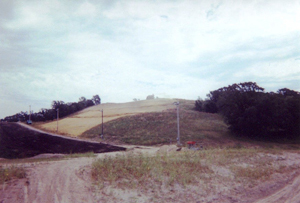 Straw blanket is spread on top of grass seed on this ski slope. High elevated slopes benefit from a cover such as this straw blanket by maintaining moisture for stronger, faster growth & avoiding run off in case of rain or wind. 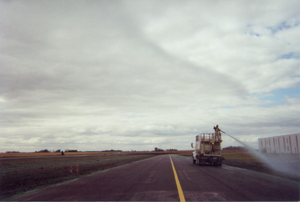 Hydroseeding gets any seeding job done quickly & with advantages such as moisture retention for quick germination plus other additives: fertilizers,tackifying agents, green dye, etc. 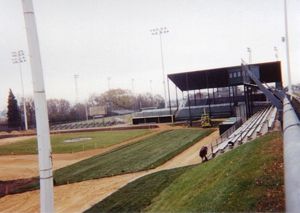 With sod that we purchase through Blue Valley Sod, we complete many installation jobs for sports facilities, businesses, home owners, contractors, etc. We have the proper machinery, equipment, & manpower to handle all sizes of installations. 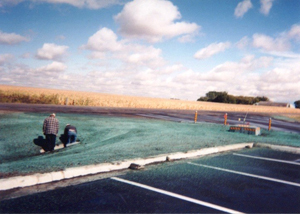 Hydroseeding is a slurry of seed & mulch that can be sprayed on areas such as this to speed up installation time. Slurry can include mulch to maintain moisture, fertilizer, tackifying agents, green dye, & other additives. A silt fence/straw mulch combination provides extra protection against heavy rains & wind. Silt fence eliminates sediment disbursement while straw mulch holds in seed to help provide moisture for growth. We are able to purchase & install silt fence in order to help stop sediment disbursement during heavy rains or wind before seed or sod has enough time to grow & prevent erosion. 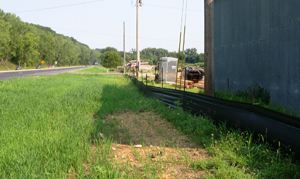 One of the many local needs that Erosion Control Plus fills is in helping customers. 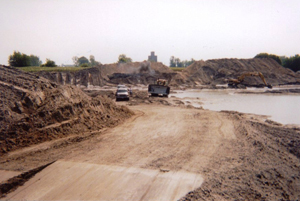 They can request sand, dirt, gravel, & rock to be delivered by one of our trucks. 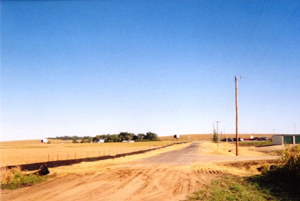 We also provide snow removal, grading work, backhoe work, etc. Please contact us for all of your needs.